The Zippie GS is designed to grow with kids, eliminating the need for expensive replacement wheelchairs every time your child shoots up a few inches. The chair's ability to adapt is rooted in it's unique Built-in Growth System. The dual seat rails allow the seating system and accessories to be securely mounted without interference within the same small space. The chair's durable hub is now stronger than its ever been, enabling the wheels to lock securely into place and eliminating dependence on the rear wheel's tire pressure for a safe, locked position. Minimal adjustments are needed and cables are conveniently kept out of the way, making engagement of the hub lock a breeze. 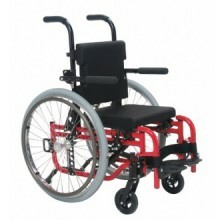 The locking mechanism provides multiple mounting positions for quick and easy access. Seat Width 10" - 18"
Seat Depth 10" - 18"
Overall Width 19" - 27"
Front Wheel Size 3" - 8"
Rear Wheel Size 12" - 24"
Back Height 12" - 16"
Click the button below to add the Zippie GS Pediatric Wheelchair to your wish list. All prices are in USD. Copyright 2019 Medit Equip.